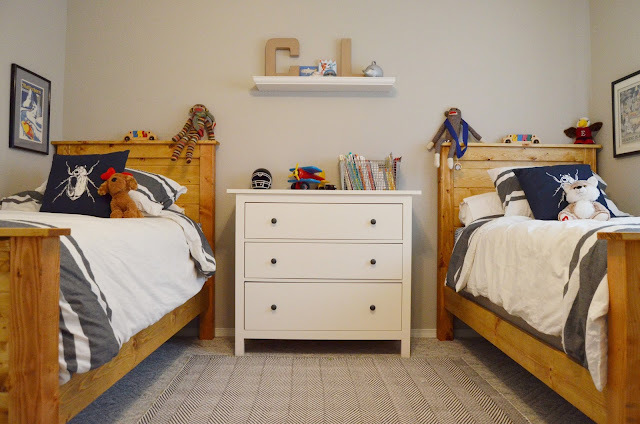 From sounds of stifled giggles way past their bedtime, silly or surprisingly deep conversations, to catching the older brother reading to the younger, there's something pretty special that happens when kids share a room. Don't get me wrong, there's still more fights than I'd like and at times there's not enough space for the both of them, but I'm relishing this time and one day they'll look back and remember these times fondly–at least that's what I keep telling them. 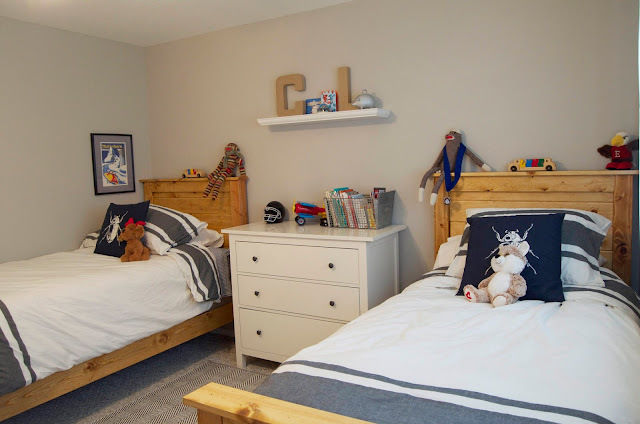 When we moved in, there were enough rooms so the boys didn't have to share, but we wanted them to continue to bunk together. For one, Luke could keep an eye on his younger more mischievous brother and we could also use the extra room as a guest/office. 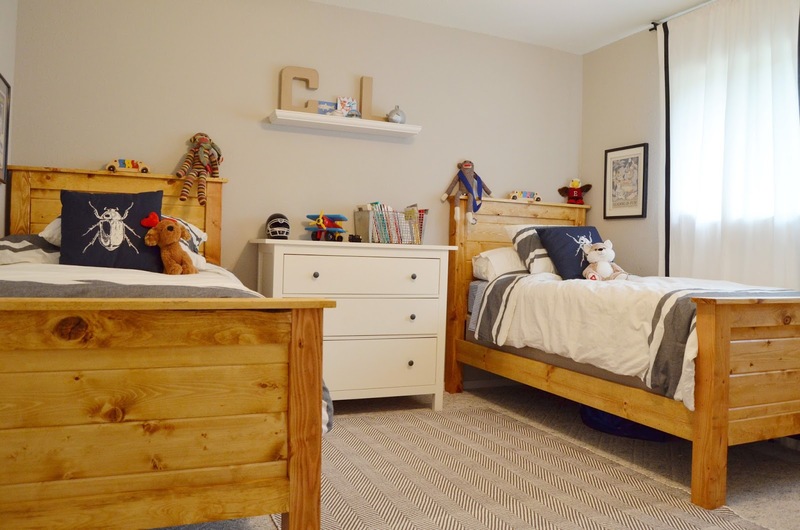 While we still wanted it to be a room for boys, we were leaning towards a more sophisticated and neutral design this time around. 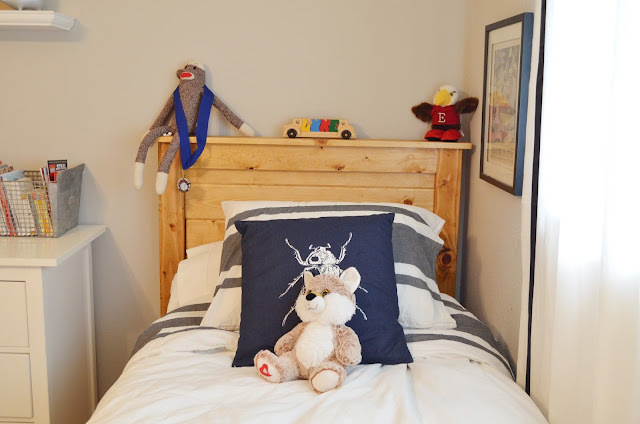 In our last home, the boys' room had lots going on–gray and white striped walls, a DIY platform bed, a chalkboard wall–nearly every trend you could imagine. 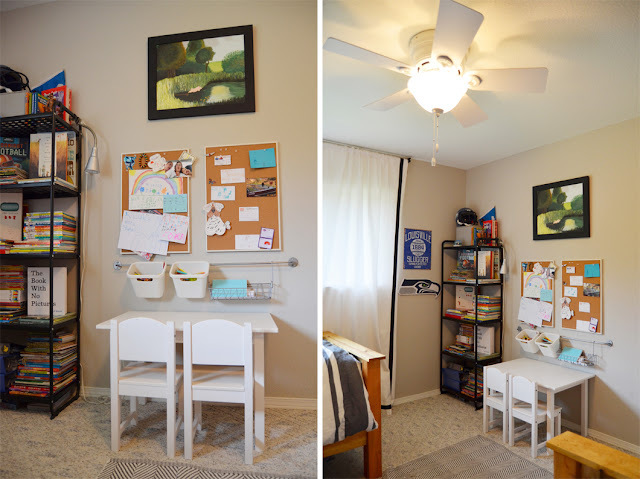 For this space (and the entire home), I wanted rooms to be much more simple and serene. It probably has something to do with all the chaos that two wild boys and busy schedules bring. 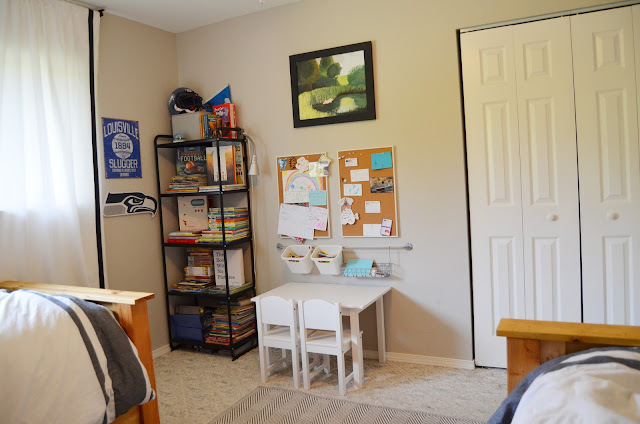 We painted over the blue walls with Benjamin Moore Revere Pewter and painted the dark blue ceiling, closet doors and trim in Benjamin Moore Simply White, a creamy, warm white. The neutral greige walls and white ceiling make the room feel clean, bright and quite a bit larger. 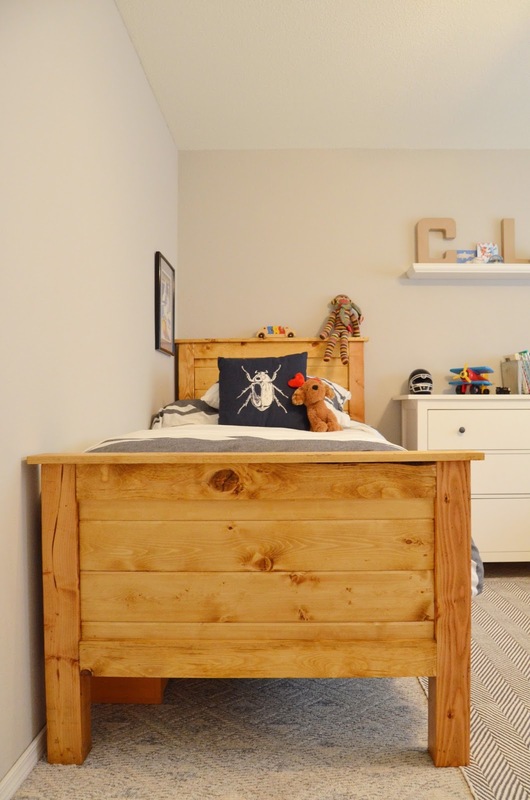 We built the beds using plans from Jennifer Largesse at Build - Basic and utilized a few things we had around the house like the metal shelving unit and dresser from Ikea. Then we threw in some cork boards so the kids could display their artwork and a couple bug pillows for good measure. 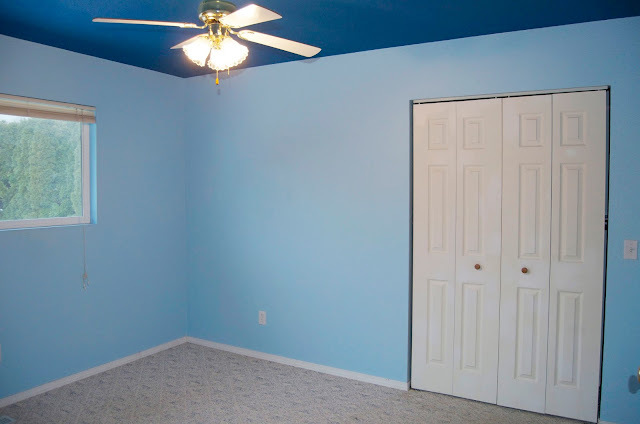 We also replaced the dated ceiling fan with an updated model from Hunter. This simple paint color update we've made, from the all blue room above to the more modern, neutral and versatile room, will grow with the boys and allows us to make changes to the room later on down the road without a bunch of work.